This Alkalising Recovery Juice with citrus fruit is tasty, refreshing and best of all, it boost your recovery after an intense work-out. Did you know that eating alkalising foods is crucial to repair your body after a work-out? Physical exertion builds up lactic acid in the body. In an acidic body lactic acid is not properly flushed out of your system. Instead it builds up in your body, which can result in post-workout tension, fatigue and muscle stiffness. Ever suffer from days of muscle soreness and fatigue after an intense work-out without understanding why? Check out what you ate the days before your work-out and the days after. I notice a huge difference in my recovery and increasing stamina and endurance. If I eat the right foods before and after my training (I do endurance rowing training and yoga) I have hardly any muscle ache and my endurance improves with time. When I eat the wrong foods (read acidifying foods) I can suffer from sore muscles and fatigue for days. A great and easy way to increase the amount of alkalising foods in your diets is juicing. This Alkalising Recovery Juice with whole unpeeled lemon and orange is one of my favorite; it’s so refreshing and I love its intense citrus flavours. 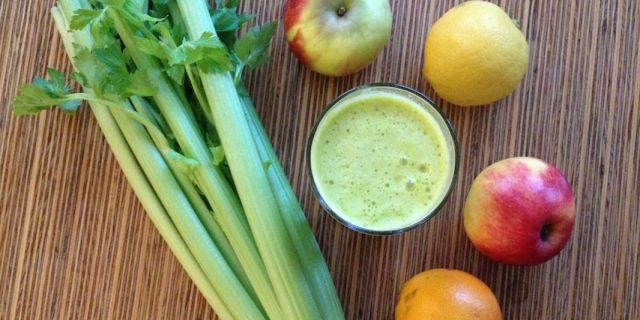 Juice your produce and enjoy this Alkalising Recovery Juice right away!